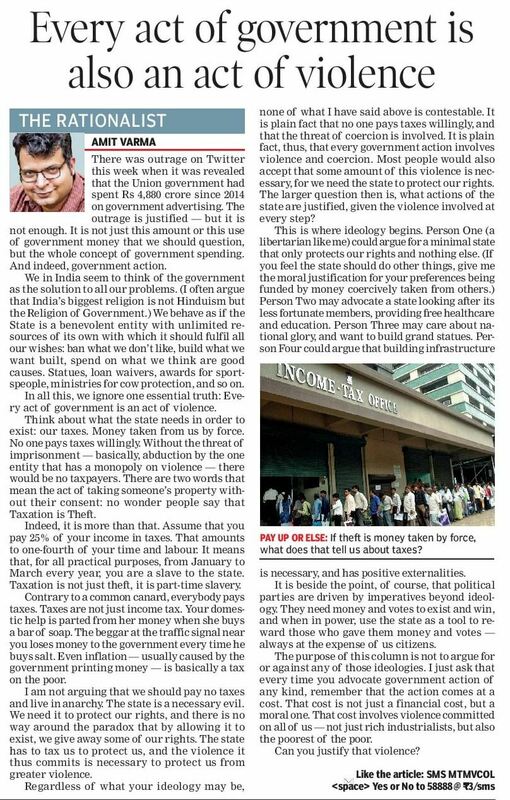 This is the 9th installment of The Rationalist, my column for the Times of India. There was outrage on Twitter this week when it was revealed that the union government had spent Rs 4880 crores since 2014 on government advertising. The outrage is justified—but it is not enough. It is not just this amount or this use of government money that we should question, but the whole concept of government spending. And indeed, government action. 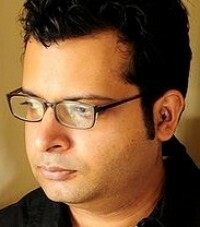 We in India seem to think of Government as the solution to all our problems. (I often argue that India’s biggest religion is not Hinduism but the Religion of Government.) We behave as if the State is a benevolent entity with unlimited resources of its own with which it should fulfil all our wishes: ban what we don’t like, build what we want built, spend on what we think are good causes. Statues, loan waivers, awards for sportspeople, ministries for cow protection, and so on. In all this, we ignore one essential truth: Every act of government is an act of violence. Think about what the state needs in order to exist: our taxes. Money taken from us by force. No one pays taxes willingly. Without the threat of imprisonment—basically, abduction by the one entity that has a monopoly on violence—there would be no taxpayers. There are two words that mean the act of taking someone’s property without their consent: no wonder people say that Taxation is Theft. Indeed, it is more than that. Assume that you pay 25% of your income in taxes. That amounts to one-fourth of your time and labour. It means that, for all practical purposes, from January to March every year, you are a slave to the state. Taxation is not just theft, it is part-time slavery. Contrary to a common canard, everybody pays taxes. Taxes are not just income tax. Your domestic help is parted from her money when she buys a bar of soap. The beggar at the traffic signal near you loses money to the government every time he buys salt. Even inflation—usually caused by the government printing money—is basically a tax on the poor. I am not arguing that we should pay no taxes and live in anarchy. The state is a necessary evil. We need it to protect our rights, and there is no way around the paradox that by allowing it to exist, we give away some of our rights. The state has to tax us to protect us, and the violence it thus commits is necessary to protect us from greater violence. Regardless of what your ideology may be, none of what I have said above is contestable. It is plain fact that no one pays taxes willingly, and that the threat of coercion is involved. It is plain fact, thus, that every government action involves violence and coercion. Most people would also accept that some amount of this violence is necessary, for we need the state to protect our rights. The larger question then is, what actions of the state are justified, given the violence involved at every step? This is where ideology begins. Person One (a libertarian like me) could argue for a minimal state that only protects our rights and nothing else. (If you feel the state should do other things, give me the moral justification for your preferences being funded by money coercively taken from others.) Person Two may advocate a state looking after its less fortunate members, proving free healthcare and education. Person Three may care about national glory, and want to build grand statues. Person Four could argue that building infrastructure is necessary, and has positive externalities. The purpose of this column is not to argue for or against any of those ideologies. I just ask that every time you advocate government action of any kind, remember that the action comes at a cost. That cost is not just a financial cost, but a moral one. That cost involves violence committed on all of us—not just rich industrialists, but also the poorest of the poor. Can you justify that violence?